This year's Blue Mountain 400k follows the 2009 edition with the exception of some route tweaks at the start and finish (with revised controles before and after the the start/finish). Last year, the first controle stop at Ahern's was a bit slow with service, so we'll be stopping at a mini-mart in Bangor instead. The routing to the finish from the Schyulkill River has always been a difficult choice between a busier, but more direct route or alternatively, a quieter one with more navigation. 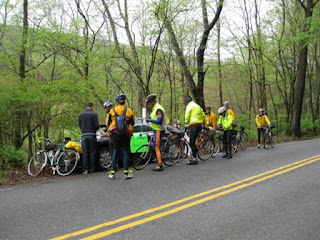 This year, the routing is more along the lines of "quieter with more navigation" -- however, you will be following the Endless Mountains 1240k route from Pine Grove (mile ~122) all the way to the outskirts of Quakertown (mile ~236). The course was marked with an "EM" last September, and many of the markings should still be visable to help with navigation -- but please don't rely upon this, since some of the markings could be faded or paved over by now. -The start/finish hostel is getting pretty full, with many opting for the Friday/Saturday dorm room option. There are 3 dorm rooms that can hold a total of 18 bunks. The women will be staying in the "Family" dorm, which has 4 bunks. Early arrivals will be staying in the "Womens" dorm. Later arrivals will be placed in the "Mens" dorm (so as not to disturb those already asleep). If roughing it in a full dorm room is not for you, there are several hotel options in Quakertown. -You may unload your car near the hostel porch but please park your car in the large parking lot off the driveway, half way between the road and the house. Be sure to park on the gravel area -- it is easy to get your car stuck if you wander off into the grassy area, especially if it is wet. The limited parking spots near the house are reserved for the hostel parents, John and JerryAnne, and event personnel. - If you are staying both Friday and Saturday night, use the same bunk. When you are ready to leave, please strip the sheets off, place them in the hamper in the hallway, and leave the bunk as you found it. -Hot oatmeal and other breakfast items will be served 1 hr before the start. -There are several RR crossings on route, many, but not all are called out on the cuesheet. There are some in particular that are very hazardous, and the cuesheet warns you to dismount and walk across. The one at mile 34.8 has a bad angle, and it is early enough in the course where there might be large groups of riders together. Please take these warnings seriously and use extra caution. -At mile 52.0, the signage is poor. Smith Gap Rd also goes right here, but you will go straight as indicated on the cuesheet. -At mile 101.7, the signage is very poor. You will be on Second Mountain Rd and will come to a stop sign. The signage there seems to indicate that Second Mountain Rd continues, bearing to the left. But you actually have to make a sharp right here, to remain on Second Mountain Rd. I've added a spotting cue of heading over a metal grate bridge, which is 50 yards away from this confusing intersection. - At mile 137.6, you will be leaving the Hess mini-mart controle which is at the intersection of Rt 72 and Lickdale Rd. You ultimately will be headed on Lickdale Rd, but the only exit from the controle is onto Rt 72 where you would need to make 2 left turns across busy traffic. As alternative, you can walk your bike out across the Lickdale Rd side of the controle, and head away from the traffic light. Preliminary results for the PA Fleche have been posted ... please let me know of any corrections or other issues. Results will be submitted to RUSA shortly, and then will become final pending ACP validation. Once again, the Friday start proved to be best choice to avoid rainy weather. Team Squadra Bricconi, led by Rick Carpenter, finished at 5PM on Saturday, just as the clouds started rolling in. In almost an exact repeat of the 2008 PA Fleche, the other teams generally saw rain starting around midnight and continued through the early Sunday hours all the way to the finish. But at least the Saturady daytime weather was sunny and pleasant ... and lately, any weather without snow, sleet, or excessive wind actually passes for "pretty good" on a PA brevet. Once again, team Italian Ice gets my vote for the biggest Over Achievers ... their mileage (275) and terrain were the toughest (although I can attest that the terrain covered by Squadra Briconni is a very close 2nd for difficulty). Italian Ice also score some difficulty points with their 22-hr controle in Pottstown, PA: it's 35km mostly uphill from the Schyullkill River. Of note, Roy Yates and Shane Beake (Cyclepaths) and Clif Dierking (Italian Ice) all set personal records for their longest ride. Also of note, team Sinister Nuts recruited a team mate furtherest away: Audrey Adler came all the way from sunny San Diego, CA. And if I'm not mistaken, this is only Audrey's first or second brevet on a fixed gear setup. Team Cyclepaths scored the most flats with 9, the first one not more than 50 yards from the start. And Paul Shapiro not only single-handily contributed 5 flats toward the total, but also trashed a rim for good measure. Also of note, captains Walt Pettigrew, Bill Olsen, Rick Carpenter, and Chip Adams have successfully led their teams for 3 consecutive years, going back to the very first Eastern PA fleche in 2008. Please pass along any other team ride reports or photos ... and be sure to check back for any updates to the ride report. Special thanks to volunteer Rick Carpenter, for helping out at the hostel finish. And thanks to: Jill Hand, Roy Yates, and Shane Beake, for helping with the clean-up -- very much appreciated! Next up is the Blue Mountain 400k on May 1st ... the course is mostly based on the 2009 edition, with many route tweaks at the start and finish. ... let me know of any corrections or other issues. The results will be submitted to RUSA shortly, and will then become final, pending ACP validation. Out of a total of 36 registered riders, 34 made it to the start. One of the DNS's was Guy Harris who finds himself stranded in the U.K. due to the volcanic ash. Hopefully, he'll make it home in time for the PA Fleche next week. 7 riders opted for the 200k course and 27 clipped in for the 300k course -- all riders finished, for another 100% completion -- Outstanding results! Weather was certainly on the chilly side, mid 40F's at the start and barely making it into the 50F's. A mostly cloudy day, but the sun managed to poke through a couple of times -- and except for a few sprinkles, the day was mostly a dry one. Special thanks to Andrew Mead for putting on his fenders to ward off the rain, even though he couldn't make it to the start this time. There was a good mix of both new and veteran riders. Of note, Jud Hand, along with your's truly, have completed 4 of the 5 past PA300k's going back to the first one in 2006. And once again, a rider new to the Eastern PA series aced the course: Andrew Helms completed the course in 13:00, coming in shortly after first finisher Don Jagel. Special thanks to volunteer Bill Slabonik, for manning the finish controle -- without volunteers like Bill, it just wouldn't be possible to keep running these events. And speaking of volunteers, I'm looking for several to staff the 400k, 600k, 1000k, and Brevet Week -- drop me a note if can step up and help out. Linda McAdams writes: "....your 300K was my favorite brevet back in 2007, and this new version was just as terrific. I absolutely loved the scenery, especially between Cherryville and the Delaware Water Gap. And as always, your cue sheet was perfect and your total operation top notch. Thank you for making it such a perfect day. Much appreciated!" Don Jagel writes: ".... I just wanted to thank you for putting together a great ride. Andrew H. and I rode together on and off for most of the day, so we both had good chance for pleasant conversation and alone time to enjoy the solitude on the roads through the Delaware Water Gap National Recreation Area. The scenery along the roads close to the Delaware River is some of my favorite.... The cue sheet was spot on, and the controls were all good. Flats Deli in Hainesville makes great sandwiches and is a wonderful place to take a break halfway through the ride.... thanks to Bill for greeting us at the finish back at the Hampton Inn. It is always good to see Bill and his assistance here and on other rides is highly appreciated...."
If you have any other comments or stories to add, send them to me or post them on the message board. Next week is the PA Fleche, and after that, we're headed back to the Blue Mountains for the 400k. ... there's still time to register, if you'd like to join us. The list includes the course option I have you down for -- but you can make your final decision on which course you want to ride when you sign in -- at that point, you are committed. The 2 courses follow the same route for the first 100k, and then diverge at Water Gap -- the 300k riders will head north into the Delaware Water Gap National Park for a 100k loop before returning back to Water Gap (joining the 200k route back to Quakertown). Please note that if you change your course option at Water Gap, you will not be recognized as an official finisher. I'm hoping that the weather will be more "dry" than "wet", but it looks like temperatures will be dropping and there is the prospect of some showers -- so be prepared for this. There will be the typical hotel breakfast items available at the Quakertown Hampton Inn start/finish. If you want a more substantial breakfast, there are 24-hr diners down the road in Quakertown at the junction of Rt 663 and 309. Juan Salazar (left) manning the secrete controle on the 2009 edition of the PA300/200k. "...I liked this ride as the complete package - long straight runs that generally escaped traffic in time, quiet sections through the Water Gap recreation area, the nice view on the climbs up Mount Bethel and Blue Mountain, and the straight shot back up 611, 412, and 563 from the river. And generally fixed friendly, except that climb up and over to Millbrook Village!..." - Guy Harris, commenting on the 2009 edition. For the 2010 edition, the PA300/200k start/finish will be the Hampton Inn at Quakertown (since the hostel was already booked by another group). A special group rate of $105/night has been arranged with the hotel -- mention group code PA3, when making your reservation. Use this message board to find somebody to share a room with. The hotel will offer a buffet breakfast, starting 1 hour before the start. Alternatively, there are 24-hr diners in Quakertown, at the junction of Rt 309 and 663. Although the route is mostly the same as the 2009 edition, there are several route tweaks -- most significantly, there's no longer a climb up Mount Bethel. Instead of heading over to Great Meadows at Portland, we'll continue down along the Delaware River through Belvidere and Stewartsville along one of the many "River Roads" on course. You might think that anything called "River Road" would be something relatively level as it meanders along -- as opposed to something called "Mountain View" or "Skyline Drive." But for some reason, it seems that the River Roads on course offer some of the steepest pitches you'll see in the area! - There is a 3.5 mile stretch on Weaversville Rd that has been grinded down (probably for resurfacing), starting around mile 21. There is a ridable shoulder for most of this section, if you can hold a narrow line. But if you are lucky, there might just be a fresh ribbon of asphalt instead. 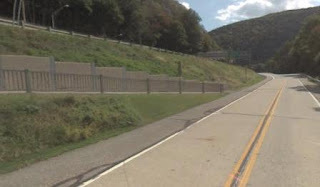 -As you return to Water Gap through Worthington State Park starting around mile 115, there are many large potholes and some rough chip seal. - Rt 611 south near Water Gap and Riegelsville is rutted with many potholes. The controle stop in Water Gap is at the bakery there. Right next door is the Water Gap diner that many veteran PA riders know as a controle on other events. Tragically, the owner was killed in a recent fire at the diner. A news report is posted here.... a very sad situation and big loss for the Water Gap community. After the controle in Water Gap, there is a 5-mile stretch that has a fair amount of traffic. But it will eventually quiet down once you get near the Delaware Water Gap Recreation Area. The PA side is relatively flat, and you should be able to bank some time here. The controle stop at Flats Deli in Hainesville makes some of the best tuna subs around, as Bill Olsen will attest to. The segment from Hainesville to Water Gap through the park, is definitely in my top-10 favorite areas for riding -- the scenary is fantastic. I've seen many bears on my trips through there (including last Saturday). You will be facing on-coming traffic as you go across the bridge.